AMO’s Messaging Tool, located in the Member Management tab in the left navigation, facilitates easy and effective communication with your contacts. You can use it to distribute weekly newsletters, send out emails to specific subsets of your membership, and create email templates to be used over and over again. When you first open the messaging tool, you will see a table of criteria / filters used to segment your contacts. You can think of the criteria from each category as forming “and” (as opposed to “or”) statements: contacts must meet every criteria you select in order to be included in the list. This is the true power of AMO’s messaging tool; you can target very specific groups of contacts with messages you tailor just for them. The next screenshot shows you all of the options available for segmenting your lists. Basically, you can filter by any piece of data you are collecting. Select Segment: Select a previously saved list segment. Basic Filters: Fill out any of these basic filter fields as you wish. They will act as “and” statements, so if you enter an organization member type and a join date, it will return only organizations of the type you selected that joined during the period you specified. Individual Member Type: The options here are pulled from the Member Types section of Member Management. Organization Member Type: The options here are pulled from the Member Types section of Member Management. Check Here If You Would Like The Returned Records To Meet All The _______ Criteria: If you check this option, it will only return records that meet all of the options you select, as opposed to the default behavior, which is to act as an “or” statement and return all items that match any of the criteria within each category (e.g. Committees). Individual Categories: The options here are are pulled from the Categories section of Member Management. If you’d like to learn more about creating or editing Individual Categories, click here. 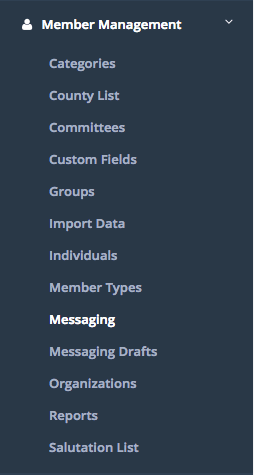 Organization Categories: The options here are pulled from the Categories section of Member Management. Include Custom Fields: If you check this box you will have the option to select from any of the custom fields you have already created within your databases for Organizations and Individuals. Save This Segment For Future Use: If you anticipate wanting to contact this segment again sometime in the future, you can give it a name and save it by checking this box. The best part about this feature is that as your list of contacts changes, so too will the saved segments; they update in real-time. 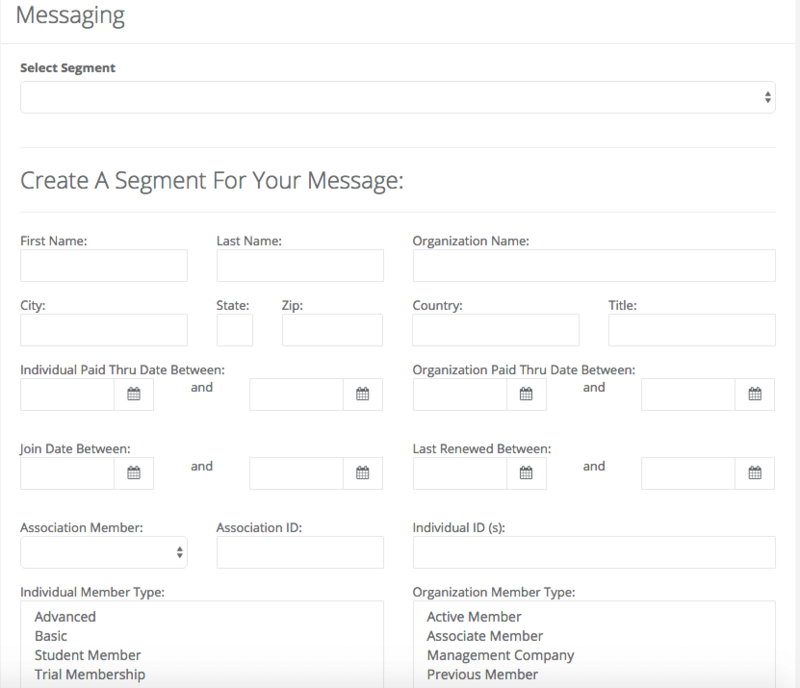 Once you have selected all of the criteria you wish to (and saved the segment if you plan on using it again), click Continue at the bottom of the page to move on to creating your message. AMO provides you with a rich-text editor for crafting your email messages. Here you can apply various text formatting options and access a number of pre-built templates to help you create more advanced, multi-column layouts. If you are HTML savvy, feel free to use the HTML editor. Just be sure to test whatever code you write across multiple email clients as support for HTML varies greatly. Merge Fields is a great tool in the Messaging rich-text editor. If you’ve used Mail Merge in programs like Microsoft Office, this will seem familiar to you. It allows you to insert fields like first name and last name that will be populated with the data from your contacts list into the body of your email. If you wish, you can copy and paste your message from a word processor or an existing document. Just keep in mind that you will lose all text formatting in the process. At the very top of the screen you can load a saved draft. The content of the draft will appear in the text editor. You can then edit the content as you see fit (without altering the original saved draft version). Check the box next to This is an official message from _______ to include this exact text at the bottom of your email. Check Append Username and Password to include the email recipients’ login information in the email. This is particularly useful when sending messages to market events; it’s a way to make it really easy for users to login and register for the event. Highly Recommended Click Email Me a Preview of the Message to view your message before sending it out. If you don’t see your preview message, check your spam folder. Once you are happy with your message, click Send Message. Don’t have time to finish your message? Want to create an email template you can use over and over? Drafts are the solution. Simply navigate to the Drafts section of the Messaging Tool, click Add Draft and then create your message as you would normally. Click Save Draft and you can reuse or edit the message any time you like. To revise a previous draft, click the pencil icon next to the draft you’d like to edit. To send an email based on a draft, go to the main messaging screen and select the criteria for your list segment or select a previously created list segment. On the editor page, select the draft you’d like to use from the drop down menu. You can either revise the draft or send as is.